Former world champion Shawn Langdon, whose 2015 season was placed in financial jeopardy one month ago, raced to the quickest Top Fuel time in NHRA history Saturday during a rain-shortened day of qualifications for the 55th annual Circle K NHRA Winternationals. The fourth and final round of qualifying was cancelled due to rain at historic Auto Club Raceway in Pomona, Calif. Racing in Round 3, Langdon set the track record for elapsed time with a 1,000-foot pass of 3.700-seconds at 328.30 mph in the Knuckle Sandwich/AJPE dragster. Courtney Force (Funny Car) and Erica Enders-Stevens (Pro Stock) also will lead their respective professional categories into Sunday’s eliminations during the 2015 season-opener of the NHRA Mello Yello Drag Racing Series schedule. Langdon’s ET will be certified as a national record if he can “back-up” the run by posting another time within one percent of his third session lap – a time between 3.700-seconds and 3.737-seconds on Sunday. Similarly, should Langdon record an elapsed time between 3.700-seconds and 3.663-seconds on Sunday, the new lower number would set the national ET record with Saturday’s run as its “back-up.” The “back-up” run must occur in the same race weekend to establish the record. The 2013 world champion in a Top Fueler fielded by Alan Johnson Racing, Langdon secured his 17th career pole. “It was just a picture-perfect run,” said Langdon, who will open eliminations opposite No. 16 qualifier Steve Chrisman. “It left, had the front end up, it was accelerating hard and it just pulled all the way until I shut it off. I went through the finish line and I thought I got a glimpse of the 3.70 on the scoreboard but wasn’t really sure. Langdon and team-owner Johnson lost their primary financial backer in early January when the Qatar Racing Club and Al-Anabi Racing unexpectedly pulled out of the series. Team-owner Johnson has committed to running the 2015 season’s first two national events with the hope of securing sponsorship for additional races on the 24-event tour. 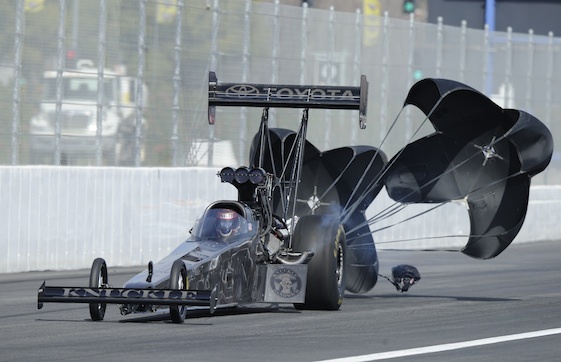 The previous quickest pass in Top Fuel was Antron Brown’s 3.701-second effort recorded in October 2012 in Reading, Pa. On Saturday, teams were set to make their fourth and final qualifying attempts when late-afternoon light showers moved into the Pomona area, eventually forcing NHRA officials to cancel the fourth session. Meanwhile, Richie Crampton raced his GEICO/Lucas Oil dragster into the second qualifying spot at 3.730-seconds and 328.46 mph. Doug Kalitta, who led qualifying through the first two rounds with a 3.733-second pass at 327.59 mph, qualified his Mac Tools dragster third. In Funny Car, Courtney Force set a career-best time in the third session at 3.995-seconds at 322.65 mph. It was Force’s first official run quicker than 4-seconds and the eighth time she has raced to the pole. Force, the No. 1 qualifier at the season-opening event in 2013, will face veteran Gary Densham in the first round. Force and John Force Racing recorded the first run under 4-seconds for Chevrolet Racing. The last time a Camaro qualified No. 1 in Funny Car was in 2004, when Tony Pedregon topped the time sheet during the Summit Racing Equipment NHRA Nationals at The Strip at Las Vegas Motor Speedway. Force is the 12th Funny Car driver to make a sub-4-second run. Auto Club Raceway has played host to the most 3-second runs with 10. The most 3-second runs at one event were recorded during the 2014 Winternationals with seven. Tommy Johnson Jr., who led Funny Car qualifying after Friday’s two sessions, will enter race day as the No. 2 qualifier via his run of 4.018-seconds at 314.36 mph in the Make-A-Wish Dodge Charger R/T fielded by Don Schumacher Racing. John Force, the defending event champion and 16-time world champ, drove his Peak Camaro SS into the third starting spot at 4.021-seconds and 320.28 mph. DSR’s Jack Beckman, the 2012 Funny Car world champion, failed to qualify his Infinite Hero Foundation Dodge Charger R/T in the first three sessions and will spend Sunday as a reluctant spectator. Enders-Stevens, the historic 2014 Pro Stock world champion, overcame a disappointing Friday by taking the lead during Saturday’s third session. Enders-Stevens’ 6.516-second quarter-mile sprint at 213.10 mph at the controls of her Elite Motorsports Chevy Camaro moved her into P1 for the 13th time in her career. On Friday, Enders-Stevens did not complete a full pass in either of her first two qualifying attempts as she struggled for traction with Goodyear Racing’s new slick tire compound. Three-time Circle K NHRA Winternationals winner Jason Line, a two-time world champion, drove his Summit Racing Equipment Camaro to the No. 2 starting spot at 6.523-seconds and 212.93 mph. Rodger Brogdon will start third in his RoofTec Camaro at 6.524-seconds and 212.33 mph. ESPN2 will televise three hours of same-day eliminations coverage Sunday at 7:30 p.m. (EST). ESPN3’s live eliminations coverage begins Sunday at 2 p.m. (EST). Top Fuel _ 1. Shawn Langdon, 3.700 seconds, 328.30 mph vs. 16. Steven Chrisman, 4.136, 273.16; 2. Richie Crampton, 3.730, 328.46 vs. 15. J.R. Todd, 3.914, 258.02; 3. Doug Kalitta, 3.733, 327.59 vs. 14. Terry McMillen, 3.897, 297.02; 4. Spencer Massey, 3.745, 332.18 vs. 13. Clay Millican, 3.833, 270.16; 5. Steve Torrence, 3.751, 327.27 vs. 12. Troy Buff, 3.815, 310.77; 6. Tony Schumacher, 3.757, 323.35 vs. 11. Antron Brown, 3.803, 313.73; 7. Larry Dixon, 3.776, 321.35 vs. 10. Dave Connolly, 3.803, 323.81; 8. Brittany Force, 3.779, 323.97 vs. 9. Leah Pritchett, 3.789, 323.04. Did Not Qualify _ 17. Steve Faria, 4.191, 218.65. Funny Car _ 1. Courtney Force, Chevy Camaro, 3.995, 322.65 vs. 16. Gary Densham, Chevy Impala, 6.957, 306.12; 2. Tommy Johnson Jr., Dodge Charger, 4.018, 314.46 vs. 15. Jeff Arend, Charger, 4.372, 263.56; 3. John Force, Camaro, 4.021, 320.28 vs. 14. Bob Bode, Toyota Camry, 4.300, 239.87; 4. Cruz Pedregon, Camry, 4.027, 308.00 vs. 13. John Hale, Charger, 4.193, 295.34; 5. Tony Pedregon, Camry, 4.030, 304.39 vs. 12. Matt Hagan, Charger, 4.090, 310.70; 6. Ron Capps, Charger, 4.037, 317.94 vs. 11. Alexis DeJoria, Camry, 4.085, 305.84; 7. Robert Hight, Camaro, 4.045, 319.60 vs. 10. Tim Wilkerson, Ford Mustang, 4.066, 311.77; 8. Del Worsham, Camry, 4.045, 314.09 vs. 9. Chad Head, Camry, 4.060, 312.50. Did Not Qualify _ 17. Terry Haddock, 12.025, 293.03; 18. Jack Beckman, broke. Pro Stock _ 1. Erica Enders-Stevens, Chevy Camaro, 6.516, 213.10 vs. 16. Matt Hartford, Pontiac GXP, 6.611, 208.59; 2. Jason Line, Camaro, 6.523, 212.93 vs. 15. Joey Grose, Camaro, 6.603, 209.20; 3. Rodger Brogdon, Camaro, 6.524, 212.33 vs. 14. Deric Kramer, Dodge Avenger, 6.595, 210.37; 4. Drew Skillman, Camaro, 6.527, 212.09 vs. 13. V. Gaines, Dodge Dart, 6.571, 211.03; 5. Vincent Nobile, Camaro, 6.531, 212.23 vs. 12. Allen Johnson, Dart, 6.545, 211.89; 6. Larry Morgan, Camaro, 6.535, 212.90 vs. 11. Jimmy Alund, GXP, 6.543, 211.56; 7. Greg Anderson, Camaro, 6.535, 212.19 vs. 10. Shane Gray, Camaro, 6.543, 211.93; 8. Chris McGaha, Camaro, 6.538, 212.03 vs. 9. Jonathan Gray, Camaro, 6.540, 212.43. Did Not Qualify _17. Jeff Isbell, broke.